MANILA, Philippines - State weather bureau PAGASA on its 5:00am update on Wednesday, December 31, 2014 announced that 'Bagyong Seniang' has maintained its strength as it moves closer to Palawan. At 4:00 AM today, the center of 'Bagyong Seniang' was estimated based on all available at 150 km Southwest of Cuyo, Palawan (9.7°N, 120.1°E) with maximum sustained winds of 65 kph near the center and gustiness of up to 80 kph. It is forecast to move West Southwest at 13 kph. 24 hour (January 1, morning): 130 km Southwest of Puerto Princesa City. 48 hour (January 2, morning): 365 km South of Pagasa Island, Outside the Philippine Area of Responsibility (PAR) . These areas will have stormy weather with heavy to intense rains. Residents in low lying and mountainous areas are alerted against possible flashfloods and landslides. 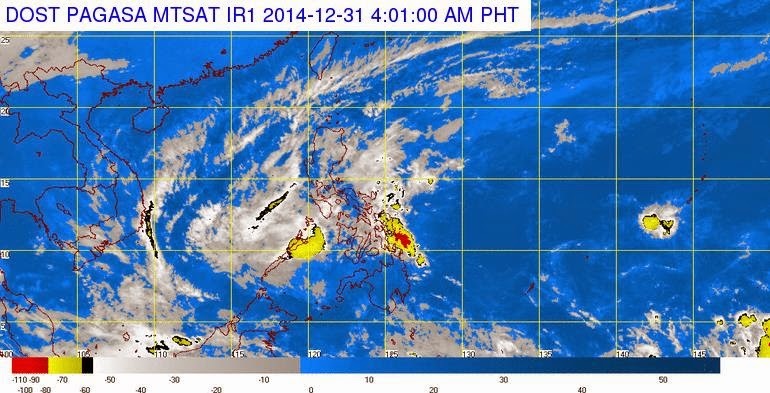 Palawan will experience stormy weather with rough to very rough seas. Visayas, Bicol Region and the Provinces of Quezon, Mindoro, Marinduque and Romblonwill be cloudy with light to moderate rainshowers and thunderstorms. Metro Manila and the rest of Luzon will have cloudy skies with light rains. Mindanao will be partly cloudy to cloudy with isolated rainshowers or thunderstorms. Moderate to strong winds blowing from the Northeast will prevail over Luzon, East to Northeast over Visayas and coming from Southwest to Southeast over Mindanao with moderate to rough seas. The estimated rainfall amount is from 7.5 – 15 mm per hour (moderate - heavy) within the 300 km diameter of the Tropical Storm. Residents in low lying and mountainous areas of the provinces with PSWS#2 and PSWS#1 are alerted against possible flashfloods and landslides. Ocean waves may reach up to 5 meters. Fisherfolks and those with small seacrafts are advised not to venture out over the seaboards of Luzon and Visayas.